Our attentive readers should remember that we promised to write reviews for the winners of The ArenaCast Ultimate Monthly Polls. Unfortunately it's taken us a rather long time to prepare these reviews, but we are finally ready to share the review for the "InHuman Race" EP by the Polish unsigned alternative band Scarlet Hatchings - the winners of The ArenaCast Ultimate Monthly Poll in December 2011. The review is written by The ArenaCast host - Damien V.! Read and enjoy! 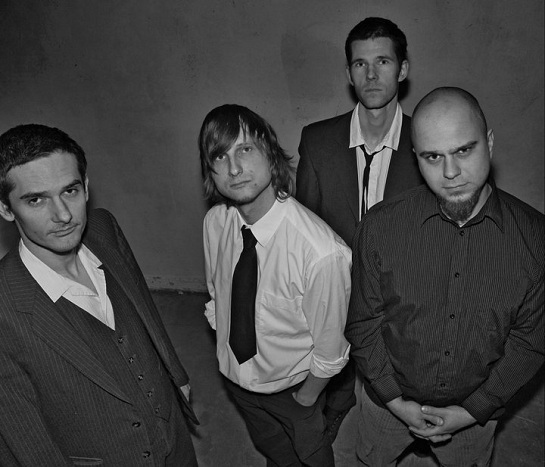 Scarlet Hatchings is a progressive alternative rock metal quartet from Poznan in Poland. Moulding a collaboration from such former bands as “Sweet Noise", "StrangE", "Deadline”, and since forming in 2009, the members are Seba bringing in the vocals, Qba on guitar, Szopa the drums and Mateo driving the unrelenting bass lines. In 2011 the band released the kicking debut EP “InHuman Race” and produced a stunning music video clip for one of the tracks “Sincerely Yours” from the debut EP. The tracks are driven by mind blowing machine gun guitar lick attacks backed by a tightly syncopated rhythm section that lays a solid musical bed for vocalist “Seba” to plant his brand of punchy vocals into the mix. “Seba” seems to be able to sustain a deep metal growl which guarantees to give nightmares to any teenager who dares to listen and who will in turn be driven to rebel against their parents and teachers to take over the world with a Armageddon metal revolution! They step into the progressive metal boots snugly and although predominantly their tracks have solid vapour trail riffs booming from your speakers cabinets, they also know when to bring the musical feel back to a gentle light touch with a graceful presence. The fast paced track “Sincerely Yours” is a perfect example sounding a fast brutal attack upon your ears initially, but then transcending with an almost longing sense of remorse giving rise to deep unresolved emotions and self-discovery for the listener’s softer side. Managing a solid rhythm base with the music maintains an honest familiarity to the songs begging the first time listener to chant along as if they have boasted the track in their collection for many years. With commanding vocals and harmonies backed by a firm tactical back line, the music writes a tasty recipe for a nutritious hot meal of burning alternate heavy metal and should definitely be a winner for the di-hard fans of Limp Bizkit – Korn - Getaway Plan and similar sounding groups. With everything said and done I suggest you do yourself a favour and go out and grab a copy of Scarlet Hatching’s blistering EP “InHuman Race” turn your stereo system up to 11 then rise up and enjoy the ride. Scarlet Hatchings`s song "Only Way To Die" was featured in E100 of the ArenaCast. You can also read a brief interview with Scarlet Hatchings posted in our blog.